Where did the butterfly roof come from? From Marcel Breuer. In 1945. That’s a more crisp answer than you usually get with design questions, but I believe it’s right. That’s a cornball thing to say but maybe it conveys something about Breuer’s relative humility and humanity. His career took him from truly humble Hungarian origins — he hadn’t seen a city until he was 18 years old — to the Vienna Academy of Fine Arts circa 1920, teacher of carpentry at the Bauhaus, a wartime trans-Atlantic escape with Gropius, and a professorship at the Harvard GSD until one morning in May 1941 when he and Gropius split. His Harvard students loved him. Word is, he remained approachable, cooperative with his clients, and never made a big stink about design changes or anything else. After a relative dry spell building houses on the east coast, in the late 40s and early 50s, Breuer triumphantly returned to postwar Paris in 1953, for the career-changing UNESCO headquarters, and then further on a rich 30 year history designing attractive large sculptural concrete objects. That American dry spell is worth attention. Under tight budget constraints Breuer was forced to experiment and improvise. He was really good at that. According to Isabelle Hyman’s book on Breuer, he picked up the butterfly roof idea from Le Corbusier’s “Errázuriz House” (1930), which was unbuilt and situated in Chile. Lajko’s first real butterfly roof is on the 1945 Geller House I on Long Island. 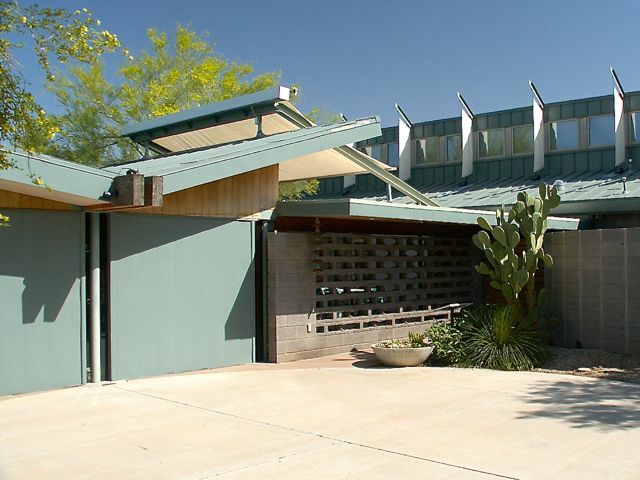 While strict, spare and restrained (still acceptable to the Official Modernist Playbook), its rakish roofline breaks out of modernism’s aesthetic cul-de-sac with a certain reckless joy. Without eaves, and with its hollows, the massing emphasizes the play between volumes and voids to become almost toylike. The Geller I is coming up on sixty years old. It looks twenty. And it also came with a theoretical basis about social spaces, no extra charge: Breuer’s concept of the “binuclear” house, the “butterfly bipartite” with “activity zones”, one wing for the quiet bedrooms and another wing for the more active living/dining/kitchen area. He was onto something. Breuer repacked these ideas into a tremendously popular exhibition house for the garden of the Museum of Modern Art, shown April 14 through October 30th, 1949, with another emphatically asymmetrical butterfly roof. That House in the Garden directly led to at least four other similar, modest, butterfly-roof private commissions for families named Marshad, Tiller, Lauck and Hanson. After the show the display house itself was cut into four pieces, crated out of the MOMA garden, and trucked off to the Rockefellers’ estate at Kykuit. More importantly, tens of thousands of postwar tastemakers and home buyers walked through it and absorbed its vibe. Then the butterfly was out of the bottle. The idea was eagerly copied, from Palm Springs Alexander tract homes built between 1957 and 1961, Levitt developments in Maryland, to the Parr’s house in The Incredibles. They land on the eye as a witty inversion of what you expect, with this exuberant, outward body language. The Hyman book is worth a look for similar ideas. For fans of modernist houses it’s an alternate history, both familiar and strange, as a catalog of Breuer’s play with materials, his use of anchoring stone walls for psychological effect, the way he coped with forced economy, and those lovely calculated imbalances of his. He was way ahead of his time. The Geller House prefigures Saarinen’s 1962 TWA terminal, and its much-discussed “flight imagery”, by about 15 years. And it comes fully two decades before Charles Moore’s highly influential houses at Sea Ranch in 1966, so often seen as the starting point of that 70’s residential vernacular; monopitch roofs sans eaves, an overall sense of sculptural composition, with vertical cypress siding. Definite family resemblance. So, where do we find a well done butterfly roof in the Valley? There’s at least one good example being the award-winning 1995 APS Environmental Showcase Home designed by Eddie Jones at 60th Street and Greenway Road, which uses the shape for style and rainwater collection. You can find it on the azarchitecture website. Have a favorite of your own? Be sure to let us know about it. If not, you know there’s still time and space for new commissions. Nudge, nudge, wink, wink.